Pacific NorthWest Computers: If you're trying to keep cool, your computer probably is too!! If you're trying to keep cool, your computer probably is too!! If you're trying to keep cool this summer, your computer probably is too!! 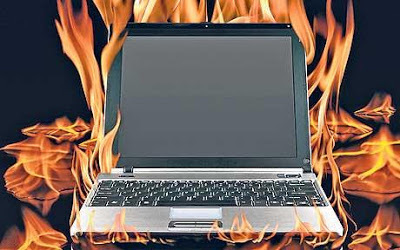 Simply put, if your computer becomes too hot, it is possible to destroy and shorten the lifespan of the hardware inside your computer, leading to irreparable damage and potential data loss. Besides losing your data, heat pecks away at your computer's internal organs (the motherboard, CPU, and more) significantly shortening its lifespan. If it's hot in the room where your computer is, get a little fan pointed toward the system to help circulate the air around it. Or, if you are VERY careful (and want to try), turn the computer off, take the side cover off and blow the fans out with canned air and/or very carefully vacuum the inside of the computer out. That can sometimes give you a computer a night and day difference in temperature as well as keeps your computer fans from sounding like jet turbines! *Here's a word of caution: If your computer is overheating, resist the urge to take the side of the case off the computer. Most computers are very carefully designed to ensure that cool air is delivered to critical components. Removing the side of the case disrupts the circulation or air for the system. If cleaning and what not does not help you with to get your computer running cooler, you probably want to start planning some system-cooling upgrades; which we can help with!! Any questions or ANYTHING, drop us a line or give us a call! !